Outstanding contributions in chemistry, physics, biology, mathematics, engineering, or social and behavioral sciences. The National Medal of Science is an honor bestowed by the President of the United States to individuals in science and engineering who have made important contributions to the advancement of knowledge in the fields of behavioral and social sciences, biology, chemistry, engineering, mathematics and physics. The twelve member presidential Committee on the National Medal of Science is responsible for selecting award recipients and is administered by the National Science Foundation (NSF). The National Medal of Science was established on August 25, 1959, by an act of the Congress of the United States under Public Law 86-209. 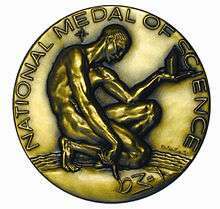 The medal was originally to honor scientists in the fields of the "physical, biological, mathematical, or engineering sciences". The Committee on the National Medal of Science was established on August 23, 1961, by executive order 10961 of President John F. Kennedy. On January 7, 1979, the American Association for the Advancement of Science (AAAS) passed a resolution proposing that the medal be expanded to include the social and behavioral sciences. In response, Senator Ted Kennedy introduced the Science and Technology Equal Opportunities Act into the Senate on March 7, 1979, expanding the medal to include these scientific disciplines as well. President Jimmy Carter's signature enacted this change as Public Law 96-516 on December 12, 1980. In 1992, the National Science Foundation signed a letter of agreement with the National Science and Technology Medals Foundation that made the National Science and Technology Medals Foundation the metaorganization over both the National Medal of Science and the very similar National Medal of Technology. For his leadership in the science and engineering basic to aeronautics; for his effective teaching and related contributions in many fields of mechanics, for his distinguished counsel to the Armed Services, and for his promoting international cooperation in science and engineering. The first woman to receive a National Medal of Science was Barbara McClintock, who was awarded for her work on plant genetics in 1970. Although Public Law 86-209 provides for 20 recipients of the medal per year, it is typical for approximately 8–15 accomplished scientists and engineers to receive this distinction each year. There have been a number of years where no National Medals of Science were awarded. Those years include: 1985, 1984, 1980, 1978, 1977, 1972 and 1971. The awards ceremony is organized by the Office of Science and Technology Policy. It takes place at the White House and is presided by the sitting United States president. Each year the National Science Foundation sends out a call to the scientific community for the nomination of new candidates for the National Medal of Science. Individuals are nominated by their peers with each nomination requiring three letters of support from individuals in science and technology. Nominations are then sent to the Committee of the National Medal of Science which is a board composed of fourteen presidential appointees comprising twelve scientists, and two ex officio members—the director of the Office of Science and Technology Policy (OSTP) and the president of the National Academy of Sciences (NAS). According to the Committee, successful candidates must be U.S. citizens or permanent residents who are applying for U.S. citizenship, who have done work of significantly outstanding merit or that has had a major impact on scientific thought in their field. The Committee also values those who promote the general advancement of science and individuals who have influenced science education, although these traits are less important than groundbreaking or thought-provoking research. The nomination of a candidate is effective for three years; at the end of three years, the candidates peers are allowed to renominate the candidate. The Committee makes their recommendations to the President for the final awarding decision. The National Medal of Science depicts Man, surrounded by earth, sea, and sky, contemplating and struggling to understand Nature. The crystal in his hand represents the universal order and also suggests the basic unit of living things. 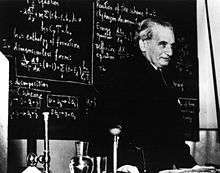 The formula being outlined in the sand symbolizes scientific abstraction. ↑ John F. Kennedy (21 August 1961). "Executive Order 10961 Providing Procedures for the Award of the National Medal of Science". The White House. Archived from the original on 2007-08-19. Retrieved 2007-10-10. ↑ AAAS Council (7 January 1979). "AAAS Resolution: National Medal of Science". American Association for the Advancement of Science. Retrieved 2007-10-10. ↑ "2008 Call for Nominations through December 7, 2007". National Science Foundation. 24 September 2007. Retrieved 2007-10-10. ↑ "The President's National Medal of Science - U.S. National Science Foundation". National Science Foundation. Retrieved 6 July 2014. ↑ "President's Committee, 2007". National Science Foundation. 15 August 2007. Retrieved 2007-10-10.